Today I thought I'd share with you my latest work. It's Ali's birthday tomorrow (happy birthday Ali!) and she wanted something to match her birthday meal outfit which was mint, silver and cream. 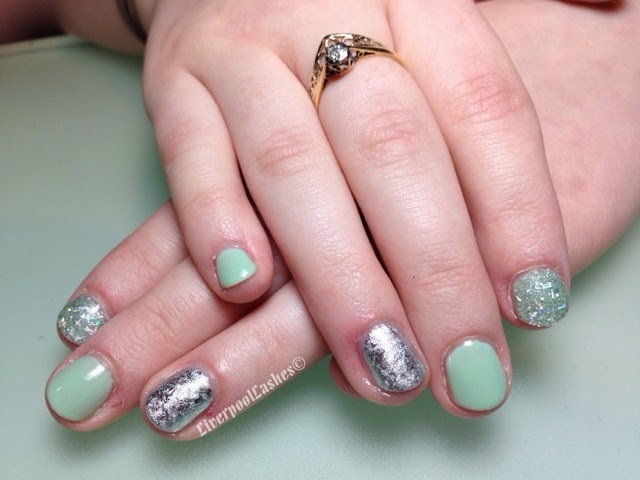 She decided on Shellac Mint Convertible with Silver Crome on the ring finger and Silver Starburst foil over it and Dashing Diva over her index finger. I think it's such a clean and fresh colour combination and Ali kept looking at them.